We collected this custom built vehicle on the 29th December 2011 even though we knew one of the blinds and some curtains were missing. These are to be provided at a later date. On the way back we decided to overnight at the Clumber Park CC site which was only a short drive away. This was just as well because it was late afternoon by the time we left the factory and the winter night was already descending. Not all the controls were familiar to me but I had driven similar automatics before and I felt reasonably comfortable driving this 26ft (8 meter) length vehicle the short distance to site. At 2ft longer and 18 inches taller than our previously owned Auto Trail Mohican, it only just fitted on the pitch I asked the site warden to allocate to us. During the evening and the next morning we continued to familiarise ourselves with our new purchase before setting off for home. The layout worked well and any concerns we had about this were soon dispelled. I had more room to move around and Wendy could manage far more easily and has gained more independence. It wasn't a cold night but we noticed the Alde 3010 central heating system did not seem to cope very well and struggled to raise the internal temperature above 16C. The layout is not conducive to the fitting of many radiators so was this the problem or had I not set the controls correctly? I asked RS for comments. I was impressed with the handling. The automatic gear change will take a little getting used to but, coupled with the cruise control it will make long distance driving much less tiring. The ride is far superior to the Mercedes Sprinter. There was much less roll and it rode rough sections of the highway far more gently. I had specified a rear window rather than a camera system to provide rear view visibility with the intention of again fitting a Fresnel lens to the back window to keep an eye on our towed car. It was on the way home I noticed the rear view mirror was missing and, with the rear window being smaller than expected, I was beginning to have doubts as to whether I had done the right thing. To make a better judgement I need to try it further with the rear view mirror fitted. I also had concerns about ground clearance. My driveway is not the easiest to get in and out of and the entrance has a nasty hump that has to be traversed. My concerns were well founded and even though I entered as slow as possible the bottom of the motorhome just grazed the top of the hump and broke the fresh water drain tap which hung just below the chassis. I ordered a replacement from CAK Tanks but the hump has got to go before I take it out again! It crossed my mind I should have had air suspension fitted to increase ground clearance? At the mid point of the wheelbase, the most likely area to bottom, clearance to the chassis is 6 inches. The tap outlet was slightly lower than this. It is possible to re-install the tap above chassis height and I intend to do this. It makes it less accessible but given access is not frequently required and that the worst highway obstructions are "sleeping policemen," which should be no higher than 4 inches, this should not be a problem. However on off road areas, care will be needed. Over the next few days I transferred our personal effects into our new possession and made sure I understood how the habitation equipment operated. I also replaced the broken drain tap installing it above chassis height. All this gave a good chance to look at build quality in detail and assess what if any extras we needed to fit. I had asked for a spare wheel but could not find one. Whilst I have only ever had one slow puncture on a motorhome in 12 years, this does cause me some concern. It is doubtful I would be able to change a wheel by myself and I will always be reliant on breakdown services. However many breakdown services do not cover the costs of this assistance if a functioning spare wheel is not carried. Further investigation is required as to options. I later decided to accept the puncture risks in the UK but to reduce repair delays on Continental trips by carrying a spare tyre. The build quality and styling is as expected and is excellent. However, I was later to discover this was let down by poor sealing of window and skylight frames. Storage is more than ample with a variety of different sized cupboards and overall the vehicle fitting out is impressive. It is only let down by the finish of the IVECO cab floor and dash board which are a little too industrial, something I will be looking into to correct in the not too distant future. There is also a lack of fittings for storage of cutlery, crockery and bathroom essentials. However, for a few pounds, this can be turned to an advantage because you can buy these to suit your requirements and place them convenient to you rather than have this dictated. There is a variety of led lighting which you can set to suit the mood. Its location and switching points have been well thought out and all but the cooker extractor fan controls and main control panel are accessible from a wheelchair. The layout is to our design and it works very well. The 5ft settee can be converted into a double bed and we can sleep five if required although the over cab bed is a little claustrophobic. Both driver and passenger seats can be turned around, which with the 5ft settee and the wheelchair, seats six comfortably. Sliding doors can be used to shut off the rear compartment from the lounge. There is ample room for wheelchair movement without getting in each others way. The Auto Trail Mohican was cramped by comparison. To provide drainage, the wet room has a recessed floor covered by a wooden grill to maintain a level floor and comprises of a Thetford bench toilet, shower, hand basin and ceiling extractor fans. It is equipped with a full width folding shower door to provide access for the wheelchair. A Tracvision R4 dual LNB dome and a Status 330 Omni directional aerial provide satellite and terrestrial TV signals to the rear fixed bedroom and the lounge seating area. The supplied Versat TVs have fully integrated DVDs, Freeview and satellite receivers and recording facilities obviating the necessity of installing any additional set top boxes. Energy sources are provided by 230 volt mains hook up, a 200APH maintenance free gel 12v battery, a 750watt inverter and two 11Kgm refillable Gaslow bottles equipped with manual changeover. Ample sockets, fuses and controls have been provided although I think the battery monitor is too simple. I would have preferred a battery monitoring system which gave battery voltages and charge and discharge currents. There is also no provision for charging the engine battery. A "Battery Master" will be required. In addition to the Alde 3010 Compact boiler, which provides heating and hot water, other appliances comprise a Thetford N150 full sized fridge and a Spinflo Caprice oven, hob and grill. The main fresh water tank holds 200 litres with a similar capacity grey waste tank. There is also a reserve fresh water tank of 93 litres. External storage is under the rear fixed bed and is accessible from both sides. There is also a large locker on the off side. External 230 volt mains and gas sockets are available and a 4.5 metre Omnistore awning has been fitted. Wheelchair access is provided via a Ratcliff Palfinger RUL35AW automatic lift which stows in a sealed cassette located under a double door entrance. Apart from the problems with the heating and the concern over the lack of a spare wheel, I have discovered two further problems. Firstly, I could not find the drain down tap for the domestic hot water boiler. RS have confirmed their oversight in not providing an access hatch to this. This will be corrected when the vehicle is returned to the factory to have the missing blind, curtains and rear view mirror fitted. The heating system will also be upgraded at the same time. Secondly, I dislike the fact the cab radio is on a timer and switches off after 20 minutes unless the engine ignition is left on. This might suit white van man but it needs further investigation as to how the system can be made suitable for motorhome use. In spite of these problems and the delays we have had obtaining this vehicle, we are very pleased with the result and are looking forward to many more years of happy motorhoming. Further information on any of the modifications or additions made to this motorhome can be monitored >here< and this report will be regularly updated with vehicle use. February 2012 - Still not had our first trip out yet but the driveway hump has been reduced in height by a couple of inches and we are raring to go. RS have got most of the corrective actions in hand and we are awaiting a date to visit the factory. With the bad weather, we are in no hurry to make the trip. However, I did take the motorhome to the local weighbridge and had the front and rear axles and gross weight checked. I had no water, fresh food or clothing on board and was minus my passenger otherwise the vehicle was in travel trim and there was still 1200Kgms of payload available. I don’t think I have any worries about overloading! This time I got back onto the drive without grazing the underside and I breathed a sigh of relief. The motorhome was returned to the factory for three days at the end of February. The additional curtains, blind, rear view mirror and an additional two blown air radiators were fitted. An access hatch was created to the boiler drain and I also had an extra Fiamma door lock added to make the accommodation door more secure. All work was done neatly, without question and free of charge. On the return drive home, the rear view mirror proved to offer good visibility and with the addition of the Fresnel lens my tow car was clearly visible. A rear view camera will probably not be necessary. April 2012 - We had a short run out in March without problems but in April we attended the National Motorhome show held at Peterborough's East of England show ground. If you attended this, you will know that some of the worst weather of the year was encountered over the weekend. There were blustery showers on the Thursday and I deployed the awning in an effort to keep the rain off the accommodation entrance. I had not had it up an hour when Wendy drew my attention to an eight inch tear where the canvas was joined to the roller. Now, I have had an awning up in much stronger winds without incident and I was immediately suspicious of a fault. Fortunately at the show there were two Omnistor agents on site and one of them, Rose Awnings, agreed to examine the awning for me and he thought the canvas had been weakened during manufacture at the point it had been attached to the roller. I immediately reflected this back to RS. Unfortunately this was not the end of the problems encountered during the weekend. The weather on Sunday night was horrendous, gale force winds with heavy driving rain straight onto the off side of the van. In the morning the field was flooded and I found a damp patch and traces of water under the off side front accommodation window. It had clearly leaked. This was also reflected back to RS and after numerous emails and calls to RS, a mutual date in September for remedial action was eventually agreed. While awaiting repairs, no further window water leakage was observed but two further minor faults were encountered. A sliding door was intermittently sticking and two small cracks had appeared in the bottom of the fibre glass frame surrounding the wheelchair lift. September 2012 - I paid a day visit to the factory to have the faults rectified. There was no obvious leakage from the window, nevertheless the window frame was removed and resealed. The awning was removed for despatch to the supplying agent and the sliding door was taken apart and fixed. The two small cracks were repaired and the frame reinforced with the addition of a stainless steel cover plate which provided a very neat and tidy solution to strengthening the area. At the end of November I returned to the factory for the habitation service and the awning was re-fitted at the same time. Investigations of how best to solve the lack of spare wheel to put my mind completely at rest did solve some of my concerns in that the breakdown services I insure with will cover this absence. Nevertheless I thought it prudent to at least carry a spare tyre on Continetal trips and I have found a way of carrying this on the tow bar strapped between the rear panel and the tow ball mounted bicycle rack. In the UK, where tyres are more available, I don't bother carrying this and remain totally reliant on breakdown services to help me out should it be necessary. Spring of 2013 - We undertook a 6 week tour of 2300 miles on the Continent. The blog of this trip can be read here. This was notable for the weather we experienced, snow and torrential rain. To my dismay and annoyance, this exposed two further leaks from skylights which I had attended to under warranty back at the factory on our return in June. We also had a scare when an EDC (Electronic Diesel Control) engine alarm occurred requiring a callout under the warranty to have the engine checked before we could continue our journey. Nothing was found to be wrong and I suspect, for various reasons, this was due to taking on a poor tank of fuel. However the warning light reappeared in the autumn and thereafter intermittently but engine performance was unaffected. On the plus side, I was impressed with the way the vehicle handled the mountain roads. The automatic gearbox made travelling on narrow roads and taking hairpin bends far easier leaving you free to concentrate on steering. We also never lacked power for the steepest of inclines. These features coupled with cruise control made long distance driving a pleasure. July 2013 - On a local trip out, it was noticed that one side of the front bumper and fairing had slipped down and inch or so. There was no danger of it falling off but some fixings have clearly loosened. Further investigation is required. January 2014 - I had both a habitation service and chassis service carried out. The habitation service was carried out at the factory and no serious problems were identified. Whilst at the factory I enquired about having a small window fitted in the accommodation door, this was possible and, to my surprise, was carried out the same day. Excellent service! The chassis service by the local Iveco agent did not positively identify the cause of the intermittent EDC warning light but the computer read out did identify low cab air-conditioning gas pressure and this may have been a contributory factor. The air conditioning drive belt was found to be worn and was replaced as was the instrument dashboard which was known to have a fault on it causing warning lights to glow dimly. The front bumper was also re-aligned. On the short return drive home, no warning lights were present and on a trip out in February everything was fine. May 2014 - While preparing for trip out I discovered the fridge no longer worked on mains hook up. I also discovered when searching the internet for further information this appeared to be a common failure of the electrical heating element on this type of Thetford fridge. While waiting for repair by a local agent under the Thetford guarantee, I ran it on gas. On a trip out I again noticed a leak in heavy rain, this time from the rear window. I was able to stop this by running sealent around the outside edge of the frame but the frame will need resealing properly on the next habitation service. June 2014 - I had hydraulic leveling fitted by Glide Rite. Wish I had fitted it sooner. It makes it so much easier with less concern about finding a level pitch. January 2015 - Both the chassis and habitation services were carried out the latter at the RS factory. A further skylight had started leaking towards the end of 2014 and I added that to the list to be corrected. During the habitation service a further leak was spotted, This plus the skylight leak and rear window leak were attended to. It is disappointing to have had so many leaks on what is after all a quality build vehicle which does not come cheap. No further problems were identified at either of these services and the vehicle also passed its MOT. January 2016 - 2015 has been a year of faultless performance. The only problem spotted was a minor oil leak from the hydraulics of the wheelchair lift. This did not cause any problems and I had the leak, which was caused by a loose hydraulic pipe joint, corrected by a local HGV garage. In February I fitted a 120 watt solar panel to the roof which uses an MPPT regulator to help maintain battery charge when no electricity is available. January 2017 - In 2016 we had a few of minor problems. The first was in July while returning home from a trip to Spain we discovered a diesel fuel leak from the pipe connecting the fuel tank to the fuel filter. With the engine vibration, it had been chaffing against a corrugated conduit pipe and this had resulted in a small leak. It was discovered due to experiencing an excessive smell of diesel fuel after refuelling. Our breakdown service, the RAC, arranged an appointment at a local HGV garage for us and a temporary repair was carried out which lasted until well after our return to the UK. The pipe was eventually replaced by my local garage and protected from a re-occurrence. The second minor inconvenience was the 3 amp fuse on the motor flush of our cassette toilet blew for no apparent reason. This is located in the cassette housing and was akward to access and replace. The last problem was discovered during the annual chassis service. One of the rear fog light connections had badly corroded. I repaired this myself by replacing the female connectors and cleaning their male counter parts. At the habitation service, after five years of use, I had the Alde antifreeze replaced. January 2018 - 2017 has been a year of greater motorhome use than average, thankfully without problems. Both the chassis and habitation equipment have performed faultlessly. An enjoyable trouble free year in which we made two trips across the Channel, a winter trip to Spain and a summer trip touring Normady and southern Brittany. In addition, numerous trips in the UK were accomplished. In December, after the annual chassis service, the MOT test was passed without even any advisories. The cost of owning our RS Endeavour is more than our previously owned AutoTrail Mohican. 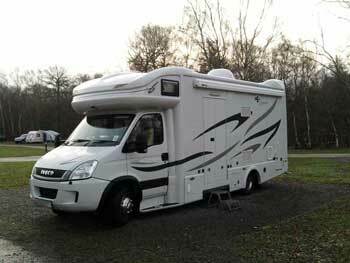 Insurance of this higher value motorhome is nearly double that of the Mohican and fuel consumption is 20 percent higher averaging 19.6 m.p.g. The current cost of ownership after 6 years and and nearly 37,000 miles of use is working out at £56 per night away or £1 per mile.